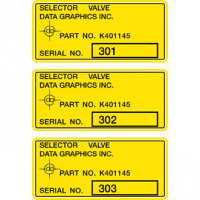 Serialized Labels | Data Graphics Inc. Serialized Labels | Data Graphics Inc. When a company is trying to improve their business practices, often times implementing serialized labels can be extremely beneficial. Serialized labels can help improve inventory procedures, attach data to a specific piece of product, keep track of data, and streamline the warranty process. 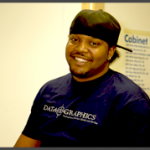 Data Graphics, Inc. is here to help you will all your serialized label needs and improve the functionality of your business. Why Serialized and not barcodes? Compared to standard barcodes, serialized labels are a little different. Standard barcodes will show normal information such as the manufacturer that it is attached to. As an example, books usually carry a barcode and may identify the title, author and quantity in stock. You can usually find serialize labels on laptops and other electronics like cell phones. In other instances you can find them on a product that carries a warranty and needs to be kept track of. Often times a serialized nameplate (serialized label) will carry explicit information about the product it is attached to such as the model number, weight, size, purchase date, manufacturer price, and almost any other information the manufacturer of the product wants to include. The biggest benefit of using serialized barcodes is to keep track of inventory. Allowing inventory personnel to scan each product instantly and pull identification information allows them to do their job quicker and keep the occurrence of miscounts down. When a company offers a warranty on a particular product it is important to use serialized labels. It is helpful and less time consuming to be able to scan a person’s product that they are claiming is under warranty and show the information it contains. Labels that are serialized allow for a company to quickly service a customer’s product and maintain a high level of customer satisfaction. Serialized labels manufactured by Data Graphics will adhere to almost any surface and customized to meet the needs of your product. 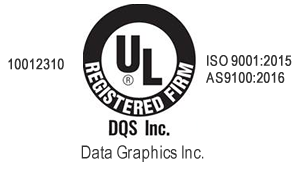 Data Graphics provides a number of materials for serialized labels including polyester, plastic, aluminum, and more. Our materials can all stand up to harsh conditions and maintain the integrity of your product.